It's got a floating desk, wraparound monitors, and a nine-foot poster of Ashoka Tano. 300+ applicants fought like StarCraft players for the job.You got it. How? Your SQL resume blew the hiring manager out of his XKCD hoodie. The database development field is tight. To get the best jobs, your SQL developer resume must stand out like Ada Lovelace at a Denny's. An SQL developer resume example better than 9 out of 10 others. How to write a PL/SQL resume that gets more interviews. Tips and examples of how to put skills and achievements on a database developer resume. How to describe your experience on a resume for an SQL developer to get any job you want. Here's a sample resume for a sql developer made using our resume builder. What's the Best Format for a PL/SQL Developer Resume? Meet Pete, the tech firm's hiring manager. He's got a DevOps heart and a data science mind. He's also got zettabytes of database developer resumes to slog through. Your professional SQL resume must convince him of your powers quick. So, use the reverse-chronological resume layout. It's the best SQL developer resume format because it puts your latest wins up top. That's crucial in an industry where yesterday's achievements are as old as COBOL. 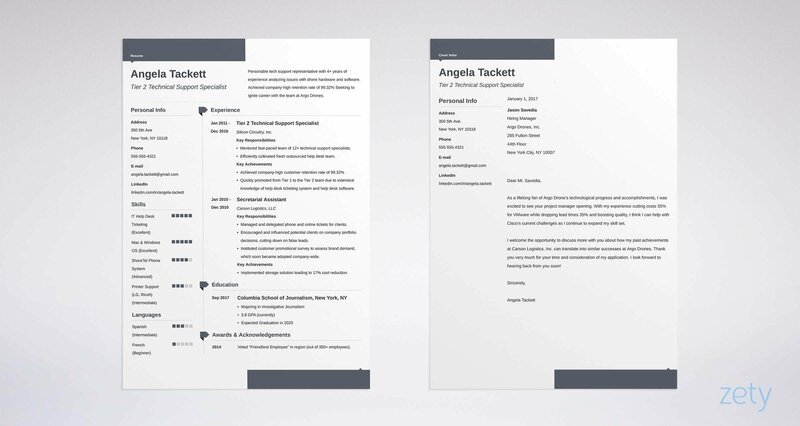 Use white space, the best resume font, and clear headings for a fast response time. 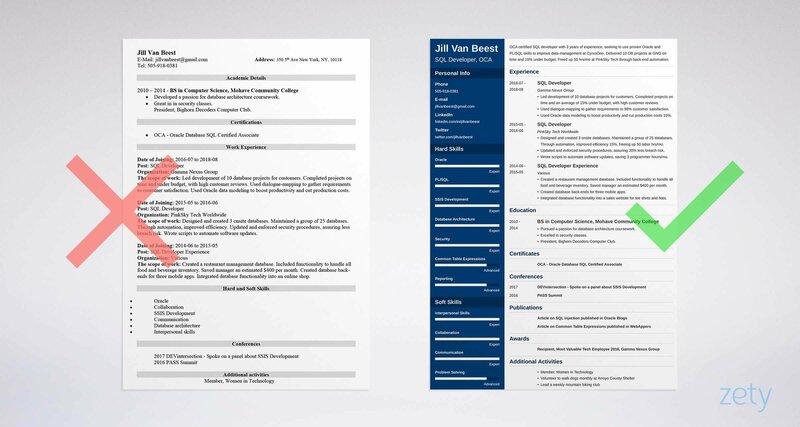 Should you send a PDF or Word Doc resume? Send a PDF resume unless the job ad says not to. Today's PDFs are machine readable. That means they play well with Applicant Tracking Software. "We need to hire this applicant." Your Oracle developer resume should INSERT INTO hiring_manager's_mind ('the words above'). But the hiring manager has to read it first. A resume summary teases terabytes of production environment experience. Use one if you've got a lot. A resume objective shows your passion when you're still in the Hello World stage. Can you spot the error in the first of our senior SSIS developer resume samples? SQL developer with 3 years of experience. In charge of daily SQL work at PinkSky Tech. Managed databases, created automation, in charge of requirements collection. Highly skilled in productivity, Oracle, and SSIS development. That's not as bad as DELETE FROM without WHERE. But it won't return a huge array of interviews. OCA certified SQL Developer with 3 years of experience, seeking to use proven Oracle and PL/SQL skills to improve data management at CyrusOne. Delivered 10 DB projects at Gamma Nexus Group on time and 15% under budget. Freed up 50 hrs/mo at PinkSky Tech through back-end automation. Boom. That resume is in the Bjarne Stroustrup zone. The measurable accomplishments make it function. Don't have that kind of SQL developer experience? See the junior SQL database developer resume examples for freshers below. Is your SQL experience is like an empty table? If so, use a PL/SQL resume objective. Passionate, Driven SQL developer, looking for entry-level job with room for advancement. Highly skilled in Oracle, PL/SQL, SSIS, and database architecture. Passion is fantastic, but it doesn't pay the bills. Hard-working OCA Certified SQL Developer. Have created working database back-ends for 4 web apps. Designed a restaurant inventory application that saved the company $400/month in labor costs. Skilled in Oracle, PL/SQL, and database security. That creates an entity relationship between you and the hiring manager. But what if you don't have even that much experience? Don't worry. I'll show that next. Pro Tip: Write your SQL BI developer resume summary or SSAS resume objective last. That'll give you plenty of material to draw from. Remember the hiring manager, Pete? I'll show you how to fix them all right now. If you've got a longer work history than Donald Knuth, show your last job first. Add 3-5 bullet points with measurable accomplishments. See the PL/SQL resume examples below for a clue. Led development of 10 database projects for customers. Completed projects on time and 15% under budget. Used dialogue-mapping to gather requirements to 98% customer satisfaction. Used Oracle data modeling to boost productivity and cut production costs 10%. The hiring manager would have to have brain_cell_count=NULL to ignore that. Your stellar SQL programmer resume just proved your skills. In charge of requirements gathering for all jobs. Handled regular updates and database maintenance. Error: interview not currently available. You need metrics. If you haven't got experience to leverage on your resume, see our next two entry-level SQL developer resume examples. Maybe you can't write an SQL developer resume with 1 or 2 years' experience. But you should put something in your SQL resume. Even if it's just SQL volunteer work. Let me show you what I mean. See the entry-level SQL developer sample resumes below? What's the difference in these database developer resume examples? SQL Experience: None yet but I'm very enthusiastic. That applicant doesn't even know what Hello, world means. Created a restaurant management database to handle all food and beverage inventory for a chef-owned restaurant. Saved an estimated $400 per month. Created database back-ends for three mobile apps. Integrated database functionality into a sales website for tee shirts and hats. Wow, right? Sudo give me the interview. But where did you get that work history? You listed projects you did for fun in school. Then you spent two days on a new project this week. Pro Tip: Need some quick projects for professional SQL developer resumes? 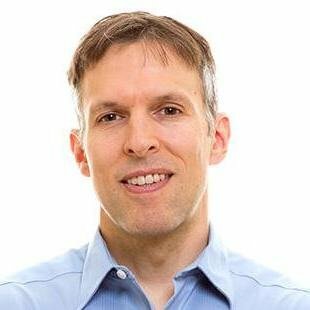 There's a great list of SQL resume projects here. Does education matter on a resume for SQL developers? Yes, you need to show your education. But it's a trojan horse. Stuff it with resume candy that'll make the hiring manager stop skimming. Then UPDATE it with achievements that fit the job. Here are two more PL/SQL resume examples. The job ad wants security, database architecture, and leadership. Look how these SQL BI developer resume samples approach the problem. Pursued a passion for database architecture coursework. President, Bighorn Decoders Computer Club. That's no generic applicant. It's a young Ben Forta. You need to link it to the job to keep the manager connected. Pro Tip: Are you writing an entry-level SQL developer resume? Make your education section longer. Even a compliment from a professor can make a good bullet point. Convince the hiring manager you've got the skills. Do that, and he'll GRANT the_interview TO you. But don't do what most people do in SSIS developer resumes. That is, don't just list a bunch of skills. Prove you've used the ones shown in the job ad. The next two SQL resume examples show how. Designed 3 onsite databases and maintained a group of 25 databases. Through automation, improved efficiency 15%, freeing up 50 labor hrs/mo. Updated and enforced security procedures, ensuring 20% less breach risk. Wrote scripts to automate software updates, saving 3 programmer hours/mo. See that? You not only list the skills, you show you used them well. Do the above, and you'll need a data warehouse to store all your interview requests. Use the PL/SQL developer resume skills list below. The skills below make great SQL developer resume keywords. Find more in job offers online. Use that plan, and you'll DROP TABLE unemployed; before you can say, "Primary Keys." Pro Tip: Want to know what skills questions the hiring manager will ask you in the interview? Check out this great article on how to screen for SQL developer skills. Does an OCA certification guarantee you'll get the job? No, but it looks mighty fine on an entry-level resume for SQL developers. But create a clear access path. First, put it in your summary. Even if the hiring manager skims at 500 MBps, he won't miss your cert. Pro Tip: Do you have certifications that don't match the job offer? Leave them off your SQL developer resume. They'll only clog up your efficiency. Let's peek in on our hiring manager, Pete. He's had so much coffee he can write Java applets with his mind. He likes SQL developer BI resumes that show experience and education. But he wants to hire a human being. Prove you are one. Add some "other" sections to your resume. But don't do it like the next of our SQL resume examples. Bam. Your SQL analyst resume just deadlocked all the other applicants. But you've probably got goodies like that in your history right now. Pro Tip: How many "other" sections go into a resume for SQL development? If your experience is thin, add more. But don't let them make your MySQL developer resume two pages. What About an SQL Developer Cover Letter? Do you need a cover letter for an SQL developer resume? Yes. But not that cover letter. You know, the one that says, "I saw your SQL programmer job description and here's my resume." Make your cover letter personal. Then, show you understand the job, and how you can help. It's been my dream since college to work as an SQL developer for Arch Span Inc.. I fully believe in your core principle of providing data excellence with best quality at lowest cost. I can bring a lot to that mission. Always end a cover letter with an offer. For example, "I'd welcome the chance to share how I achieved 20% less breach risk at PinkSky Tech." Pro Tip: Don't forget to follow up on your SQL cover letter. A follow up call in a few days can give your SQL developer resume a second chance. You probably even know SuperHomestarSQLGuy334@yahoo.com is not a professional email address. But did you know to add a personal portfolio site and a LinkedIn profile? These days, 87% of recruiters use LinkedIn for hiring. Portfolio sites show things you can't put on a resume. Use yours to list projects, reports, and other accomplishments. Then put a link on your resume. Pro Tip: A good LinkedIn profile is as important as column integrity. Do yours right with our guide to LinkedIn profile secrets. Bind your SQL resume to the job. Read the job ad carefully. Highlight what it's looking for. Then prove you've done those things in your bullet points. Summarize your best accomplishments up top. An SQL developer resume summary slows down a skimming hiring manager. Add "other" sections that show you live and breathe SQL. Publications, certifications, and classes all work well in a resume for SQL developers. Tie up loose ends in your cover letter. If you can’t address something of importance in your resume, the cover letter can pick up the slack. Do you have questions on how to write a great resume for an SQL developer? Not sure how to describe your skills or achievements? Give us a shout in the comments! Let's get the conversation rolling.